Since forming in 1995, Swedish melodic death metallers SOILWORK have been pushing the boundaries of the genre; incorporating haunting melodies and breakneck tempos. Every few years the band would drop a new record that would always seem to be better than their last. This is all gloriously captured in their latest release, Live In The Heart Of Helsinki. All aspects of SOILWORK’s twenty-year, illustrious career are on full display in this lengthy 2-disc set. Twenty three songs including “Sadistic Lullaby” off of the band’s debut release, Steelbath Suicide; several tracks off of 2013’s Living Infinite, and everything in between make up the sonic beatdown of an album. Drummer Dirk Verbeuren is unrelenting and a lot like a metronome. From rudiments to blast-beats, Dirk is what metal drummers should aspire to be and his performance on the album only supports that fact. Vocalist Björn "Speed" Strid matches Dirk’s perfection with his melodies and guttural screams. He would often try to rile up the crowd between songs. The twin guitar attack of Sylvain Coudret and David Andersson compliment one another as they trade off solos and melodies. The performance is like controlled chaos. The chaotic tempo changes and syncopated beats keep you on the edge of your seat. Dirk Verbeuren is often the driving force that rights the ship. The setlist winds up and down like the plot of a good movie. The production on the album is solid, not perfect, but solid. It may be personal preference, but I would have liked a little more low-end in the mix. The bass seems a tad buried and the snare is a bit faint, but hey, it’s a live album and yes, I know I am knit-picking. After hearing the record several times, the stand-out tracks have to be “Late For The Kill Early For The Slaughter”, “Spectrum Of Eternity” and “Rejection Role”, although there are zero duds on the record. I guess the best part of this release is yet to come. I was privileged enough to receive an advance copy of the audio CDs, but there is a live Blu-Ray/DVD that accompanies it as well. The video portion is said to include drum cams, bonus footage, and a historical documentary – what a nice touch to the already killer live set. I think that fans of SOILWORK will fall in love with this immediately, but I also think that fans of any hard rock or metal genre could appreciate the blissful mix of talent captured on this CD/Blu-Ray combo. 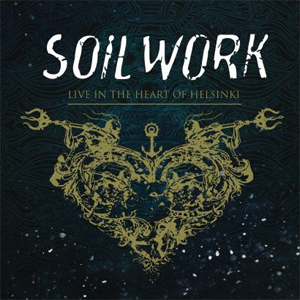 SOILWORK Live In The Heart Of Helsinki is already available in Europe and is set for an April 7th release in North America via Nuclear Blast Records.